Schools and colleges need to create an environment where students, staff and teachers feel safe and secure. Controlling access to different areas within the school or college campus will help achieve this. Access control should extend beyond just restricting entry on the main school doors; it should encompass all the vulnerable areas inside and outside the buildings. Protection needs to be given to rooms where valuable property is sited and where materials, which could prove dangerous if in the wrong hands, are kept. Offices containing personal and confidential information should not be left open and teachers should have somewhere safe for their belongings when they are in class. Installing keyless door locks is one way to create a physical barrier and deter unauthorized access. Our code locks require a number to be entered on a keypad rather than a key for access. Key management can be time consuming and expensive, especially in large schools and colleges where there is potential for lost or stolen keys. 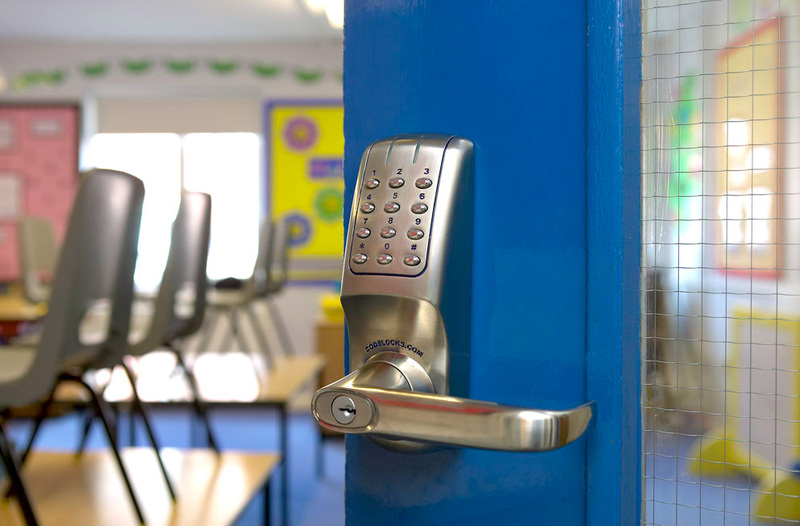 By replacing traditional locks and keys with keypad locks, schools and colleges achieve a greater degree of access control without the hassle or expense of replacing keys. Mechanical or electronic door locks? Digital door locks are either mechanical or electronic in operation. One of the main differences between the two types of locks is the way in which the access code is changed. To change the access code on a mechanical lock, the lock has to be removed from the door, taking time and causing disruption. Having many mechanical door locks on site will require more maintenance time and this may deter those responsible for changing the access codes from doing so on a regular basis. Access codes should be changed regularly as part of an on-going security routine, as students often pass codes on to friends. Changing the access code on an electronic lock takes seconds, without the need to remove the lock from the door. By making it easier to change the access code, electronic locks are more effective at controlling access. Electronic push-button door locks also offer more in terms of functionality. For example, tamper time out, which helps prevent students guessing the code, and code-free entry, which is useful when classrooms need to be left open during the day but need to be secure out of hours. To see our full range of keylessaccess control products for schools and colleges, visit our website or give us a call on 0800 393405. Keyless entry door locks – which is best?